I submitted a few vacuum-packed paragraphs for National Review on Eric Rohmer, the recently dead French master who has been my favorite living director since at least the death of Ingmar Bergman. NRO published them here at The Corner — a 300-word request for which I initially submitted 850, and trimmed it back myself to the 530 you see that keeps at least one or two examples. 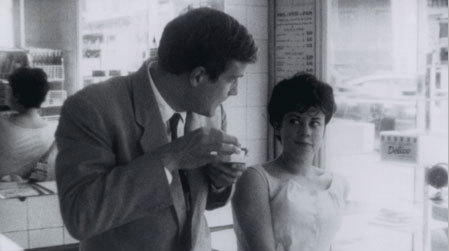 In the couple of days since Rohmer’s death, I’ve also watched CLAIRE’S KNEE and THE BAKERY GIRL OF MONCEAU (both part of Criterion’s fawesome Six Moral Tales DVD box set). The thing about CLAIRE’S KNEE that just gets deeper every time is the way it plays with its own textuality, and even anticipates and auto-critiques and/or subverts a certain shallow understanding of Rohmer’s own films. So many of Rohmer’s films place characters on holiday, in a French resort, a St. Tropez villa, a symbolic vineyard, or even lunch at an odd time of the day — the ideal time for a romantic fling, the characters self-consciously realize and proceed to map out accordingly. CLAIRE’S KNEE set in a gorgeous by a lake on August vacation, and the artist Aurora thinks to set up a “vacances-romance” between Jerome and strong-headed ingenue Laura. But things really don’t really work out, even though Jerome is willing to play his part. The film, among much else, is about the storytelling process and the way people apply it to their lives, both with foresight and retrospect — which are incompatible with each other and not what “really” happened, but how people teleologically shape their biographies. Consider also how Jerome gets his fantasy of caressing Claire’s knee (initially in a brilliantly funny way), but he hasn’t done the good deed he congratulates himself for doing at the end, because he saw something that wasn’t what he thought it was (to be more precise would be spoilerific). As for MONCEAU, it may be the ideal introduction to Rohmer — it just requires a 23-minute investment, but, astonishingly considering it’s at the start of his career, it’s a near-perfect (and perfectly representative) slice of Rohmer’s style and themes. It was shot on 16mm for practically no money, but Rohmer gave it self-consciousness and depth through a near-constant voiceover (think GOODFELLAS — in that one way only) that both explains and undermines the main character’s actions, and indicates how much of his actions are through-the-looking-glass romantic game-playing, predicated on staying one step ahead of what he thinks the bakery girl is thinking or going to do. Rohmer used voiceover a great deal in his Moral Tales, and though he used it less in his later works, he found ways to have his characters openly discourse on their thoughts instead. But the literary style, the self-consciousness, the understated-but-precise and often lovely pictorial quality, the perfect editing and framing — it’s all there from MONCEAU on. I began as somewhat of a Rohmer skeptic — early 90s “exhausting the canon”-phase VHS viewings of CLAIRE’S KNEE and MY NIGHT WITH MAUD frankly did not do much for me and I never obliged to look beyond what are still probably his two most highly-regarded films. But I got turned around, first by the successful 1999 US theatrical run of AN AUTUMN TALE and then a 2001 retrospective where I saw about 8 or 10 of his films and loved them all. 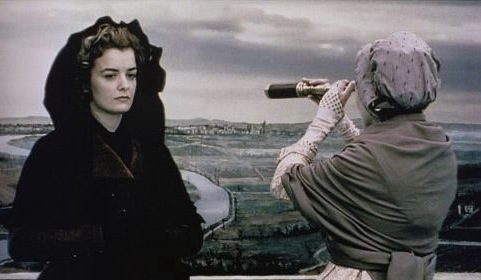 And his THE LADY AND THE DUKE at the 2001 Toronto festival removed all doubts and confirmed what I had just sensed, that Rohmer’s skepticism toward modernity went beyond soulcraft but even extended as far as dubiety towards the French Revolution — the worst event in human history, I’d say. From Grace Elliott’s sympathetic mouth we hear all the criticisms of the Revolution that Anglo-American conservatives make to this day. And in the name of the classical virtues and approach. Indeed, Rohmer’s period films all have the common quality of seeming to have been made in a pre-Enlightenment world where the cinema somehow existed — ASTREA AND CELADON and PERCEVAL both are deliberately performed in a period “style” as well as being set in the (even-more-distant) pasts. 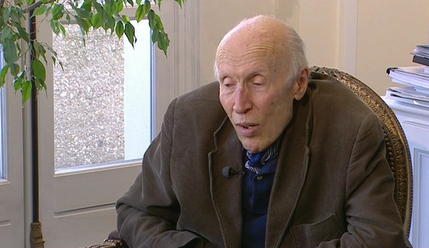 And Rohmer’s political pictures weren’t confined to THE LADY AND THE DUKE, as I may have implied for NRO. His little-seen TRIPLE AGENT shows anti-Communist Russian exiles being steamrolled by History, including the Popular Front victory in France. Unfortunately, his political satire THE TREE, THE MAYOR AND THE MEDIATHEQUE reputedly critical of local-government socialism, remains virtually unseeable to Anglophones. It’s never been released with English-subtitles anywhere in the world to my knowledge — hint, hint (and anyone who tells me I’m wrong on the factual point and how to take advantage of said error becomes my new best friend). “The Tree…” was shown last year in NY with subs during a Fabrice Luchini festival. I have seen it (not there)–one of the running jokes is that everyone involved is a leftist at pains to prove their ideological purity; the mayor’s a “new socialist” and thinks environmentalists are reactionaries, the journalist profiling him insists he’s really a rightist, etc. Not being that familiar with Rohmer at the time I came away with the impression that his own sympathies were kind of left conservative–somewhere between Wendell Berry and Lasch, perhaps. Regardless of politics he was one of the greats, and I look forward to seeing “Lady and the Duke” and remedying the other gaps in my viewing. Good points on “Claire’s Knee”, though for me Jerome is not just self-deluding but downright monstrous–the “climactic” scene with Claire was excruciatingly creepy and repulsive. The moral tales are really about moral excuses, and Jerome’s seem the most frightening. The French Revolution is the worst event in human history? Really? Explain.